“11 to 15 August 1227 B.C.E. :” The onetime diplomatic escorts left the Zedu capital to hunt for a dragon spreading chaos and corruption. In the Bamor Mountains, they slayed a two-headed Oni. At Rodaki, they saw a strange Ki-rin said to be the “guardian spirit” of the Korobokuru (eastern Dwarven) hamlet, but they were suspicious of the Scarlet Order’s widening reach. As merchant “Xiaoming Chida,” Jung-Mo spends 500 tael (250 gold pieces) in party funds on trade goods from Rodaki. He loads the metal ores and ingots onto a cart, being careful not to disturb young wyvern Niruth in its magical cage. While posing as drunken bodyguard “Nobuto,” Sonny discreetly reminds his companions to maintain their cover identities. They hope to retain the element of surprise as they enter the dragon’s territory. Soske’ is most successful in selling himself as soothsayer “Shishi.” Saigo hides his family crests as ronin (masterless Samurai) “Shiraso Takadashi.” He later composes a letter to his beloved, Princess Nayoko. Tokoro has no trouble learning about local waterways as river trader “Mu Kawa.” Toshi finds few buyers for his wares as herbalist “Tiye Akamoto,” and he returns to studying spells on the trail. The Wizard writes notes to Suki Amarna and Lady Fu Hao. Ember continues in her guise as “Jinsong Chida,” Xiaoming’s daughter, until the adventuring party is far from the hamlet. She then shifts into crane form to scout ahead in the rugged terrain. During the third watch on the first night out from Rodaki, Jung-Mo and Saigo hear people approaching their camp and arguing in Therudic. Jung-Mo quietly climbs the rocky slope to get a better view, while Saigo puts a kettle of tea over the fire and carefully welcomes the newcomers. A Korobokuru knight and his Shan Sao squire come around the bend and accept Shiraso’s offer of hospitality. Iwahara Yoshifumi appears to be another ronin, but Jung-Mo notices Tokudaiji Kiyoshi wearing the banner of the Spider Clan — not directly related to Dark Elf goddess Lolth. At Iwahara’s request, Shishi pulls out bones for divining and casts Augury . 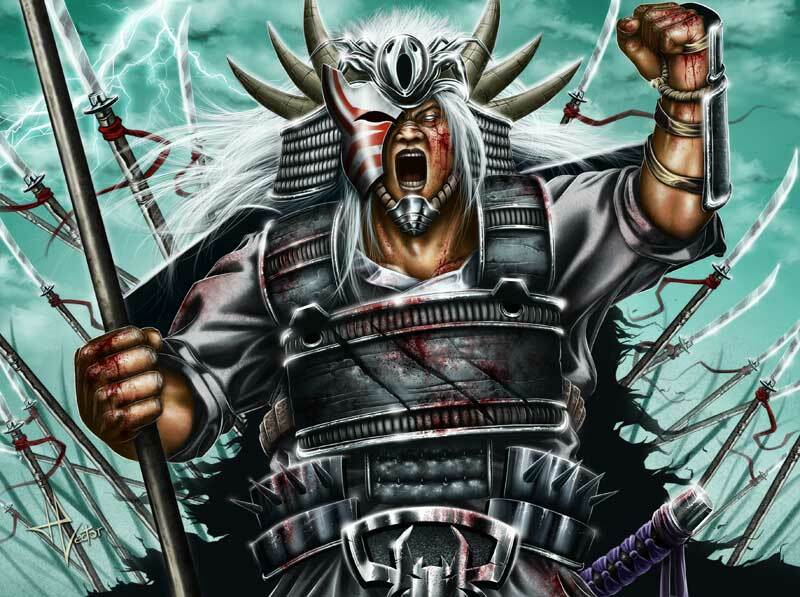 The Shengtese human tells the Korobokuru that he will die in his next duel, but the warrior shrugs off the prophecy. Nobuto shares a drink with the Halfling. Shiraso says he admires Iwahara’s weaponry and compares notes on the Orcs serving the Crab Clan. The Bamboo Spirit Folk sells the Dwarf an urgosh (double axe) taken from the Atamahuta Oni for 400 ch’ien (platinum pieces or 4,000 gold pieces). Mu Kawa counts the unusual coins, which have a dragon stamped on one side and weblike tracings on the other, before handing them to Shiraso for safekeeping. The Korobokuru and Shan Sao claim they picked up the coins while traveling and avoiding money changers. Jung-Mo stays hidden and keeps watch, while Tiye and Jinsong attend to the “bird cage” holding Niruth and keep Toshi’s tiger Amaya out of sight. In the morning, the two groups part ways. After another hard ride, the team arrives at the mountain hamlet of Shangsan. It has one inn, the “Nuoti’s Tears,” with only one well-furnished room for visiting dignitaries. Soske’ casts True Sight and verifies that the other cells are filthy rather than haunted. As the spellcasters try to clean the rooms, Tokoro finds fragments of orange silk in the fireplace, reminding some of the sashes worn by gang members back in Tong Sheng. Sonny says it’s likely just a coincidence. During the first watch of the night, Sonny and Tokoro hear noise of carousing next door, but they resist the temptation to investigate. In the morning, the group hikes east through the Bamor Mountains before turning north through the edge of the Therud Forest. Tokoro notices that there are fewer fish than usual in the mountain streams. The Hengeyokai shifts into carp form and swims to investigate. He sees a strange vine and shifts back to humanoid form, but the tendril wraps around his leg! Saigo rushes to Tokoro’s side and hacks at vines from the bank. Ninja Jung-Mo readies his bow and watches for an ambush. Soske’ casts Spiritual Ally, while Sonny tosses his kawanaga (chain with hook) to help the Hulinyuan climb out of the water. A carapaced, tentacled horror erupts from the reeds. Shukenja Soske’ and Wu Jen Toshi identify it as a Piscodaemon. The Outsider hits Samurai Saigo with its claws, but Tokoro cuts himself free. Samurai Saigo strikes the Neutral Evil creature with the no dachi (great sword) of the White Scorpion. After missing twice, Soske’ casts Ancestral Weapon to ask for a Demon Bane bow. Kensai Sonny switches to his Vorpal whip. 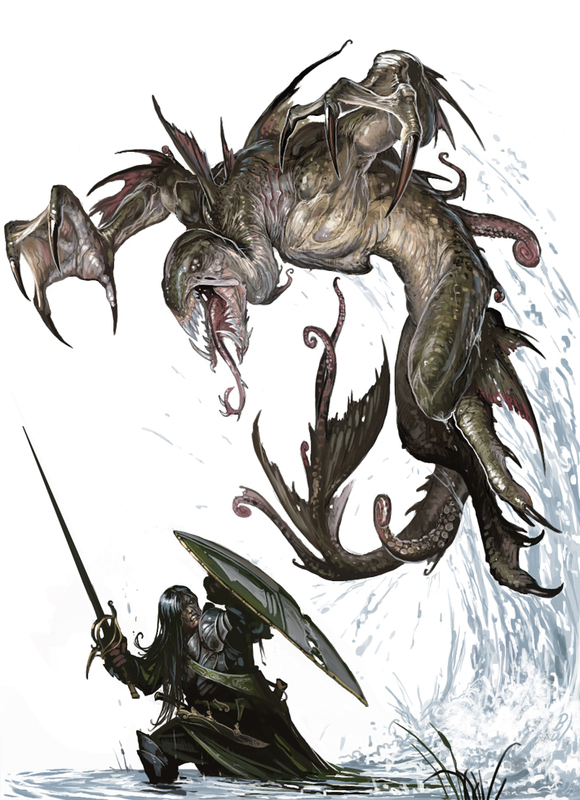 The Piscodaemon slaps at Tokoro with its poisonous tentacles and spits acid at Saigo. They fall back as Shukenja Soske’ casts Divine Might on himself. After a few swings, Sonny manages to slow the water spirit. 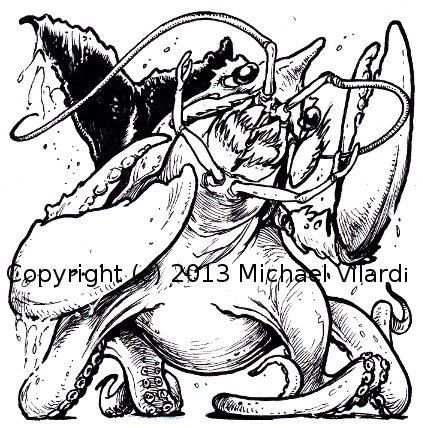 Still keen on devouring Tokoro, the Piscodaemon takes flight and releases a Stinking Cloud. Fortunately, Sonny, Saigo, and Tokoro are able to hold their breath in time. Hengeyokai Ember and Shan Sao Toshi move the horses away from the stream. Saigo slashes at the unnatural beast, and Soske’s spells help him injure it, despite a Dispel Magic. Tokoro casts Abundant Ammunition and fires arrows with his Thunderbow. Sonny does an acrobatic leap off a tree onto the monster’s back. The Piscodaemon tries to strangle the chain expert with a tentacle before falling to Soske’s arrows. The group has little time to rest, however, when a taloned Hydrodaemon swims up. Saigo wheels around with his katana and avoids the water bender’s attempt to drown him. Sonny swings his whip, and Tokoro fires a volley of flaming arrows. Soske’ Channels Positive Energy to heal his friends, even as the Hydrodaemon claws at armored Saigo. The shaman follows up on Tokoro’s shots with his own arrows, killing the daemon. 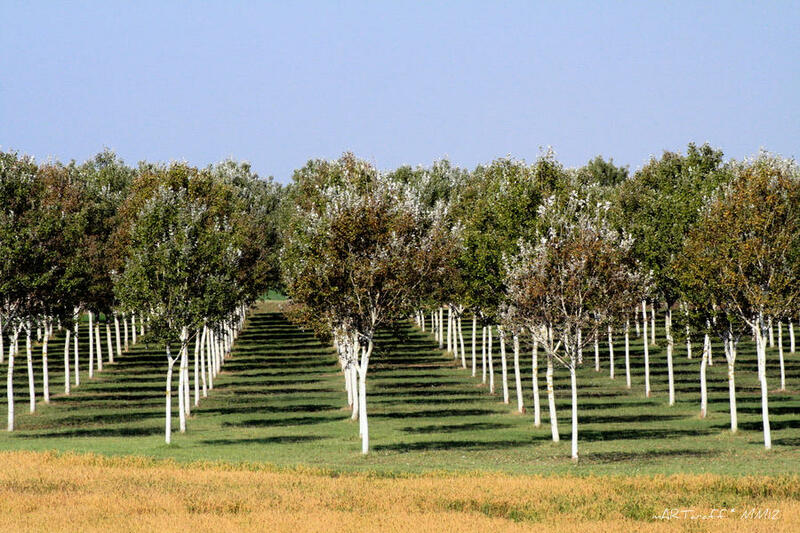 About two days’ ride from Hei Kuan, the caravan notices trees planted in rows. They bear no fruit, and no farms are nearby. Saigo recommends giving them a wide berth. As they make a detour, the explorers notice grave stones behind each tree. The riders continue north, wary of landscape warped by a dragon…. Byron and Sara, we missed you this past Friday, and I’m sorry that I’m not able to run tonight (Sunday, 4 January 2015). We’ll see if I’m well enough to attend Jason E.R.‘s “Channel 37” dimension-hopping session tomorrow, and I look forward to starting Dexter’s D&D5e miniseries soon.